Build quickly, economically and without dependence on the weather with Van Berlo Modular Foundations. Loading and unloading docks and pits are inextricably linked to the logistics sector and to commercial buildings serving this sector. These are the transfer points between internal and external transport. External transport clearly uses many different types of trucks, given the extensive options available. Once these trucks arrive at their destination, the loading and unloading docks and platform solutions must be suitable for all the different models. This is not always simple, but it is an essential part of a commercial building. 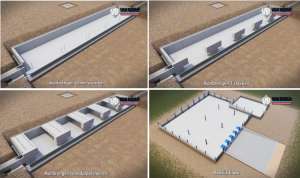 Since fitting solutions are required in today’s building market, Van Berlo Systeemfunderingen (modular foundations) has designed a solution that can be used in any distribution center or warehouse. Van Berlo Systeemfunderingen starts by pouring the first foundation layer. Once the foundation of the loading pits has hardened, the pile heads in the foundation can be crimped. The edge formwork is then applied, along with floor reinforcement in the delineated area. This completes the preparation stage, after which the dock floor can be poured. After the dock floor has been poured, Van Berlo Systeemfunderingen’s building system really comes into its own. From this point on, prefabricated rear walls can be installed on the crimped pile heads. The height of the back walls is determined in cooperation with the client. Prefab T-pieces at the same height as the rear walls are then installed in preparation for the next step: the installation of wide-slab floors. This completes the hull of the loading dock, and all that is required is a third party to install a dock leveler. Van Berlo Systeemfunderingen’s building system generates advantages for several parties in the construction process. Firstly, all components can be supplied and installed in prefabricated form if desired. This shortens the construction time, which benefits both the contractor and the developer. The prefab components also offer a second advantage. Because Van Berlo Systeemfunderingen uses exclusively prefab components for its modular foundations, it is not dependent on the weather and can always work according to plan and without obstacles. Removing such obstacles in the construction process increases the developer’s flexibility, as this enables faster completion. Van Berlo Systeemfunderingen has all the expertise required in-house, and is happy to advise on aspects such as the functionality, foundations and dimensions of customer-specific solutions for loading and unloading docks.